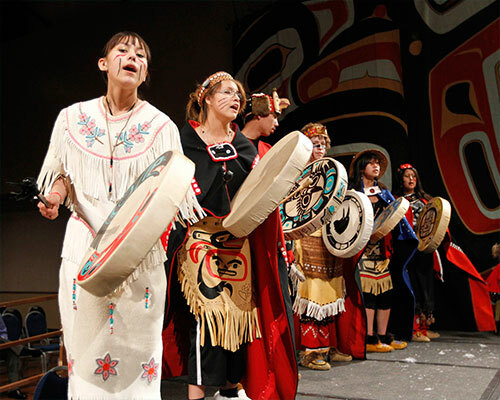 (SitNews) - The Taku Kwáan Dancers have been traveling from Atlin, British Columbia to Juneau’s biennial Celebration for years. This year, for the first time, seven of them did it the traditional way: paddling a canoe down the Taku River. 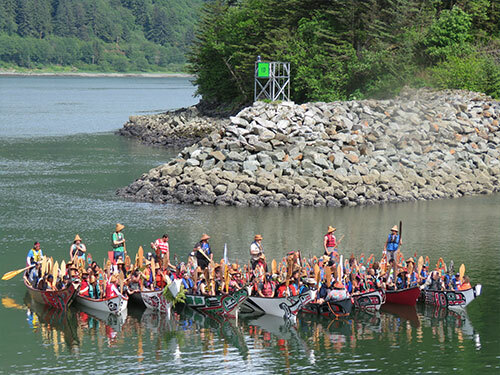 Canoes from Atlin (British Columbia), Ketchikan, Kake, Sitka, Angoon, Hoonah and Yakutat are formally welcomed to Juneau at the One People Canoe Society Canoe Journey arrival at Sandy Beach on June 5, the day before the start of the Tlingit, Haida and Tsimshian biennial event Celebration, organized by the Sealaska Heritage Institute. On the Alaska side of the border, this year’s Celebration is also host to the beginning of another kind of healing for Douglas Indian Association Vice President John Morris Sr.: Wednesday, before Celebration officially began, they raised a healing totem pole commemorating the 1962 burning of the Yanyeidi Douglas Indian Village, which stood where Douglas Harbor now is. The Taku Kwáan dancers are invited to dance at the event, he said. Though they’ve never met and they come from two different sides of a border, the Taku River is an integral part of both Carlick and Morris’ lives. Taku Kwáan: People from the Taku River Tlingit First Nation into Juneau for Celebration 2018. Master carver Wayne Carlick is in the back. 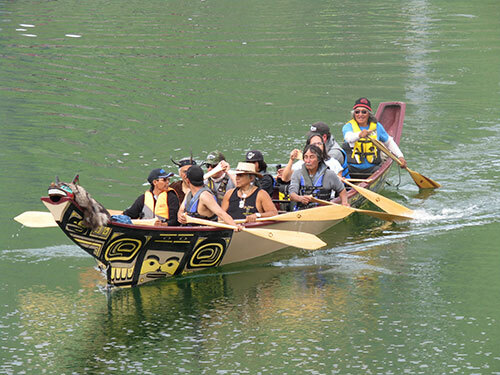 They joined canoes from Ketchikan, Sitka, Kake, Angoon, Hoonah and Yakutat at the One People Canoe Society Canoe Journey arrival at Sandy Beach on June 5. After he left the Taku, in his twenties, Carlick returned to the Taku to build a cabin there. “I used to think about how our people used to get up their river,” he said. He’d seen old, archived photos of people sailing upriver, but it wasn’t until he experienced some strong winds when he was building a cabin that it clicked. Carlick spent most of his career in Vancouver and has carved at the Smithsonian Museum and other locations as well, but in 2006, he returned to Atlin. It was the possibility of carving totems and a canoe with kids in Atlin that clinched his decision to return. 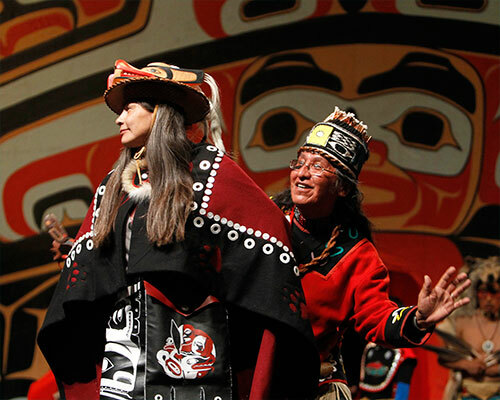 Taku Kwáan Dancers perform at Celebration in 2010. Nineteen people made the journey by river, Carlick said, seven of them from the Taku Kwáan dancers. They started their paddle about 50 miles from Juneau. Carlick’s “real dream” - though it might, he said, be more a dream for his children and grandchildren - is walking from Atlin to the Nakina River. From there, they’d board their canoes and float down the Nakina River to the Taku, then down the Taku to Juneau. “For myself, and (my) community, I think this canoe journey is very big step towards us finding our way again, as Tlingit people. Relationship building between the coastal and inland communities is a goal for many I think, and this trip will be the first of many I hope, that helps connect us as Tlingit people of the Taku,” wrote Geohaadoostée Shauna Yeoman-Lindstrom, one of the Taku Kwáan dancers who traveled another way. Mary Catharine Martin [mc@salmonstate.org] is an award-winning science and outdoors writer and the communications director of SalmonState. SalmonState, a new initiative with offices in Juneau, Anchorage and Homer, Alaska, works to protect salmon habitat and promote policies that will guarantee Alaska remains the Salmon State: home of the world's largest, healthiest and most abundant wild salmon resource, which provides culture, food, income, employment and recreation to Alaskans, Americans and the rest of the world. Representations of fact and opinions in comments posted are solely those of the individual posters and do not represent the opinions of Sitnews.